Nomad Factory digitally recreated the Equalizer and Master Bus Compressor/Limiter which were part of a well known 'British' mixing console. Designed to improve the quality of digital sound recordings, these plug-ins provide a simple and functional “vintage-style” interface, as well as low CPU consumption for lightning-fast processing. Featuring the British MCL-2269 - A Master Compressor Limiter modeled from the legendary 2254 compressor, the British MCL-2269 is the perfect choice for a truly "British-Style" vintage compression sound, adding warmth and a classic smoothness to your music. This bundle also features the British NEQ-1972 - A Four-Band equalizer modeled from the classic-vintage 1081 EQ module. British MCL-2269 - A Master Compressor Limiter modeled from the legendary 2254 compressor. British NEQ-1972 - A Four-Band equalizer modeled from the classic-vintage 1081 EQ module. 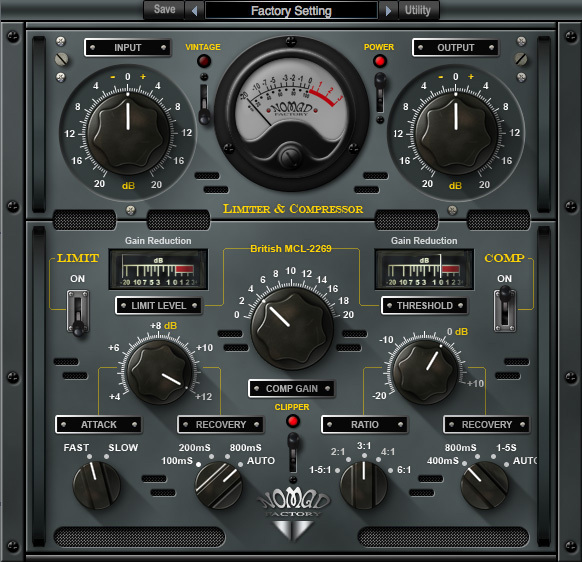 The British MLC-2269 is a simple and elegant Master Compressor Limiter (MCL). The British MCL-2269 is the perfect choice for a truly "British-Style" vintage compression sound by adding warmth and vintage compression to your music. The British "Nomad-EQ" NEQ-1972 is a simple and elegant “British-Style” four-band equalizer with a lowpass and highpass ﬁlters. The NEQ-1972 provides ± 18 dB of gain and switchable High-Q settings. The British "Nomad-EQ" NEQ-1972 is the perfect choice for a truly "British-Style" vintage EQ sound by adding an exceptional tone and character to your music. AudioUnit - AAX - RTAS (Pro Tools) and VST plug-ins. Windows 7 - Windows 8, Windows- XP, Windows Vista are supported (32-bit and 64-bit). VST, AAX and RTAS (Pro Tools) plug-ins.